A photo relay or light activated relay is a circuit which opens and closes the relay contacts according to the light.Here a photo diode is used to sense the light.The photo diode offers a high resistance when there is no light falling on it.Here the photo diode is connected in reverse biased condition.The only current flowing through it will be due to the minority carriers.When light falls on it, the current due to the minority carriers increase and the diode offers a low resistance.As a result the voltage across the diode will not be sufficient to make the transistor Q1 forward biased and the relay will OFF.When there is darkness the photo diode resistance increases and the voltage across it will become enough to forward bias the transistor Q1 making the relay ON.The diode D2 is used as a freewheeling diode to protect the transistor from transients produced to the switching of relay. By this way the load connected through the relay contacts can be switched ON and OFF according to the light falling on the photo diode. The preset R1 can be used to adjust the sensitivity of the circuit. The D1 can be any general purpose photo diode. sir, how to write a program on micro controller 8051 is based on counter? can you please briefly explain how the circuit function? 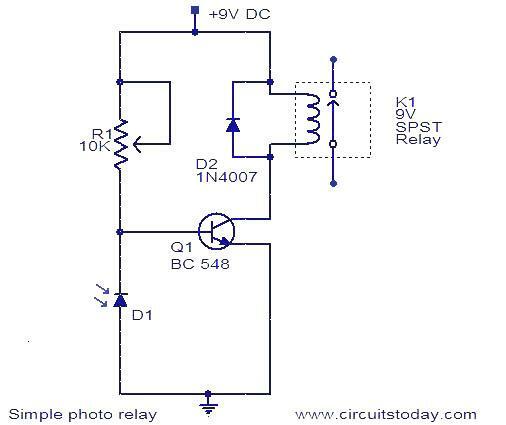 Can this circuit be modified as follows. 2 The relay replaced with a sewing machine bobbin fully wound with 30 gauge magnet wire. I don’t need to output a lot of power, just enough to “kick” the coil periodically. The circuit will be used to power a Pendulum. See (Magbot Pendulum on Youtube). A couple of these are powered by a Solar cell hacked from a one dollar garden light. With R1 set anywhere between 5K and 10K, I get 8.13 volts across the relay coils and they close when I apply the 9V, with or without IR or visible light. I’m using an IR Photodiode. I have the short lead on the photodiode connected to R1 and to base on the transistor. When I shine an IR LED into the Photodiode, the voltage across the photodiode jumps to 0.6V (out of circuit) so I know it is working. the general porous photo diode will not on when light falling on it as result the relay is picked permanently. What is the power consumption if its dark and what it is when is light on the photo cel? I have an old Lafayette Photo Electronic Relay model# KT-133A. Does any one know what it is. There are some things that I know a lot about-electronics and women are not on that list. I tried this circuit but it is not working.the relay is picked permenently even the presents of light or not. D1 and R1 are swapped in the circuit and the relay will stay on. make the circuit with them swapped and it will work.